Travis Vader first killed either Lyle or Marie McCann during a violent roadside robbery in 2010, then killed the survivor to "eliminate" that person as a witness, Crown prosecutors allege in closing arguments obtained by CBC that are being presented at Vader's murder trial in Edmonton today. 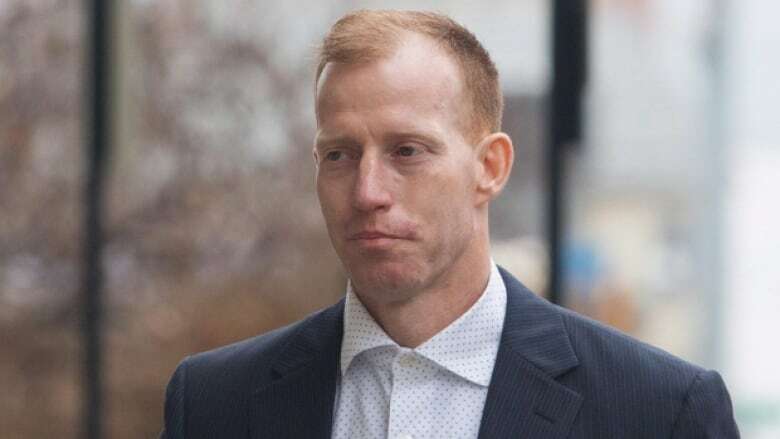 Travis Vader first killed either Lyle or Marie McCann during a violent roadside robbery, and then killed the survivor to "eliminate" that person as a witness, Crown prosecutors allege in closing arguments being presented today at Vader's murder trial in Edmonton. 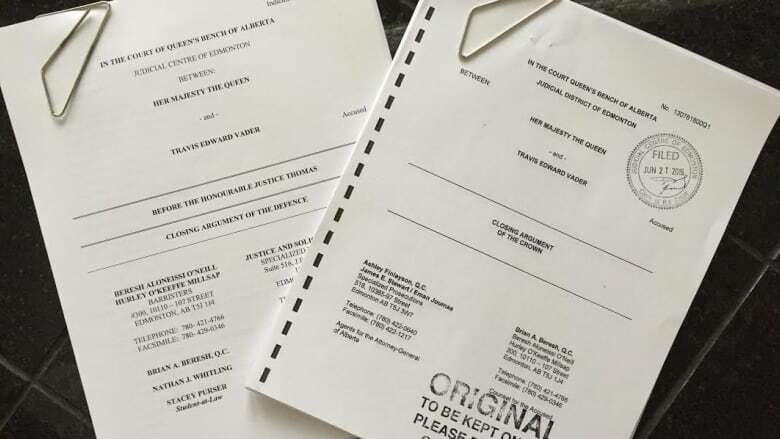 The written arguments, including the Crown's theory of what happened to the two seniors from St. Albert, Alta., in July 2010, were obtained by CBC News. Court of Queen's Bench Justice Denny Thomas is hearing those arguments Wednesday. Vader, who is currently behind bars, has pleaded not guilty to two counts of first-degree murder. "Mr. Vader had a violent confrontation with the McCanns while they were stopped on or near the side of Highway 16 somewhere in the Peers, Alta., area most likely occurring when Mr. Vader was in the process of stealing from them, and that during that violent confrontation, Mr. Vader murdered either Lyle McCann or Marie McCann," the court document states. "Given the age and strength of the surviving McCann, it is submitted that that person would have posed no threat to Mr. Vader and that he murdered the survivor to eliminate them as a witness." Vader was originally from Niton Junction, Alta., but had no fixed address at the time of his arrest. He is accused of killing the couple on July 3, 2010, just hours after they started a road trip to British Columbia. Prosecutors say the McCanns were killed sometime between noon and 2:14 p.m., when, they say, the evidence shows Vader used the McCanns' cellphone to contact his then girlfriend. In a 30-page written summary, the prosecutors admit the precise time and location of the murders remain a mystery. But they argue "the bloodletting event" took place between Wildwood and Edson, or at or near Peers, Alta. Peers is about a two-hour drive from St. Albert. The Crown admits its case is circumstantial. But prosecutors say that "when all the evidence is considered, the only rational conclusion that can be reached is that Travis Vader murdered Lyle and Marie McCann sometime on July 3." But defence lawyer Brian Beresh said in his final arguments that the prosecution "exaggerates its case" and suggests "it is not truly circumstantial in nature." Beresh suggests the Crown hasn't proved beyond a reasonable doubt that the McCanns are dead, although he admits it is a "possible theory." Their bodies have never been found. Court of Queen's Bench Justice Denny Thomas expects to hand down his decision in August or September. Vader has pleaded not guilty to two counts of first-degree murder in the deaths of Alberta couple Lyle and Marie McCann. "The prosecution's proposed logic appears to be that disappearance equals death and that death equals murder. Such logic must be rejected," Beresh wrote. Beresh admits the McCanns' disappearance is mysterious. But he added "we simply do not know what happened to Lyle and Marie McCann, when it happened, where it happened, or by whom and why it happened." DNA evidence is crucial to the Crown's case. The Crown says Vader's DNA was found on the steering wheel and armrest of the McCanns' SUV, on a can of beer in the front seat cup holder and on two of Lyle McCann's baseball hats found inside the vehicle. Lead prosecutor Ashley Finlayson wrote: "The Crown submits that the DNA was deposited in those locations because Travis Vader was driving the SUV ... while consuming a can of Boxer beer." He added "the only conclusion that can be reached (after considering all the evidence) is that Vader placed those two baseball hats inside the SUV after Lyle McCann was murdered." The defence dismisses the DNA evidence as "inconclusive." Beresh suggests all it shows is that Vader had some "incidental contact" with the vehicle between July 3 and July 16, when the vehicle was found. According to the defence, Vader could have leaned into the SUV and sneezed, or even had contact with another person or object that later made its way into the vehicle. Beresh also concedes it's possible Vader stole the SUV and later abandoned it. In his 53-page submission, Beresh wrote "the court would have to reject, among many other things, the very real possibilities that Mr. Vader discovered the SUV and cellphone together and abandoned, after the true killer had detached the motor home, or that Mr. Vader was given the SUV and cellphone" by someone else. Someone used the McCanns' cellphone on July 3 beginning at 2:14 p.m. to call and text Amber Williams, Vader's ex-girlfriend. The Crown says Vader had to be the one sending those texts and making those calls, arguing "it strains credulity to even consider that it could have been someone else." But the defence has floated the idea of an alternate suspect, whose first name also begins with the initial T. Terry McColman, at one time in Vader's circle of friends, is dead now, but the defence suggests he was the author of those texts and calls. The Crown refutes that. "There is insufficient evidence for Terry McColman to be considered an alternate suspect," the written argument says. The defence insists there is no forensic proof Vader ever had the McCanns' cellphone — no fingerprints, no DNA, no witnesses who saw him using it. Beresh wrote that "relating possession of the phone to the death of the McCanns relies upon speculation and conjecture and not reasonable inference drawing." Dave Olson, a star witness for the Crown, testified Vader showed up at his home on July 3 sometime around noon, driving a truck and complaining he had no money. The Crown says Vader returned to Olson's home around 5:20 p.m. that same day with cash and a different vehicle — an SUV that resembled the one belonging to the McCanns. Prosecutors say Vader left Olson's house frustrated and angry and ran into the McCanns after that. But Beresh alleges Olson's testimony was "purchased" by the RCMP. He calls Olson's evidence "clearly carefully selected and rehearsed," and argues "it should be given no weight." The defence also suggests Vader showed up at Olson's house the first time around 2:30 or 3 p.m. That's about the same time prosecutors say the McCanns were murdered. Beresh wrote "even if Olson is slightly off on his evidence with respect to the timeline, it is inconceivable that Mr. Vader would be able to brutally kill two people, hide their bodies and hide their very large motor home in the short amount of time that he was away from Olson's residence. "Moreover, it defies credulity to think that an individual who just killed an innocent elderly couple would go to his buddy's house immediately after to sit and have beers with him for several hours and do nothing but send love messages to his ex-girlfriend." The keys to the McCanns' SUV were discovered by RCMP in the flatbed of a stolen truck linked to Vader. The Crown does not mention that testimony in its closing argument. But the defence suggests it's "inconceivable" a number of Mounties missed finding the keys during their many examinations of the vehicle. Beresh noted "the RCMP not only had the opportunity to plant the SUV key in the truck, but ... also had the means … and a strong motive to tie the vehicle to Mr. Vader." The McCanns' motorhome was discovered on fire at a campground outside of Edson on July 5, 2010. During the trial, a number of witnesses testified Vader was at a rooming house in Edmonton between July 4 and July 9. Beresh said that "should leave the court with serious doubts as to Mr. Vader's involvement in the fire at this motor home, and ultimately the alleged deaths of the McCanns." The prosecution paints Vader as a financially destitute man, desperate for methamphetamine. They point to evidence from numerous witnesses who testified they took drugs with Vader, and theorize he robbed the McCanns to get money for his next fix. The defence calls that issue a "red herring." "It appears the prosecution's theory is that Mr. Vader ... was so desperate that he would somehow interfere with a large RV/SUV combination somewhere on a busy public highway where detection would be obvious ... all for money to fuel his alleged addiction. "It is a theory not supported by evidence and which can only be considered speculation and conjecture." Both the Crown and defence agree Vader can only be convicted on the basis of circumstantial evidence "if the evidence is inconsistent with any other rational conclusion." Finlayson, the lead prosecutor, argues it's the only "possible conclusion." But Beresh said "the gaps in the evidence are too great to allow the necessary inferences to be drawn.". He added: "The defence submits that the prosecution has fallen woefully short of meeting its burden of proof beyond a reasonable doubt for any criminal offence." After closing arguments are delivered, it will be up to Thomas to weigh all the evidence and reach a verdict, something he has indicated will take until the end of August or early September.